Description: Erect to shortly decumbent herb, usually < 30 cm high, glabrous. Leaves 1–5.5 cm long, 2–12 mm wide; lowest ones ovate, deeply cut and petiolate; upper leaves lanceolate and pinnatifid becoming linear with margins toothed to entire and ± sessile. Inflorescence raceme-like, 1-sided, to 12-flowered; pedicels to 20 mm long in fruit. Calyx lobes 3–5 mm long. Corolla to 17 mm long, dark blue or violet, pale at base; tube 4.5–7 mm long; middle lower lobe obovate, lateral ones oblong or obovate-oblong, 2 upper lobes incurved and pilose. All anthers with a dense brush of apical hairs. Capsule obliquely ovoid, swollen on upper side, 3.5–4 mm long and diam. Distribution and occurrence: Grows in rock crevices in forest and heath usually on sandy soils; north from Royal N.P., and inland to Howell and west of Tenterfield. Text by B. Wiecek. Updated by Peter G. Wilson June 2010. Taxon concept: Flora of NSW 3 (1992). 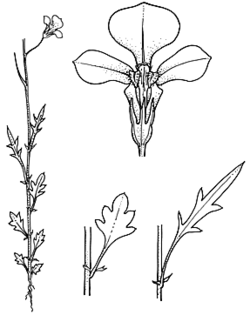 The previous name, Lobelia gracilis, was found to be illegitimate and a new name given.